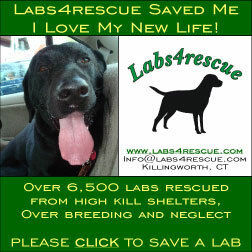 Dedicated to providing a better life for rescued or displaced Labrador retrievers and mixed labs. We provide veterinary care, we spay and neuter and promote responsible pet ownership for these lovable canines. I'm Jack. I was rescued from a hunter, who didn't care much for dogs. I was chained outside with little to eat and no veterinary care. When he was in the mood, he would shoot at me with his rifle. My story would have ended in that yard, if not for another hunter, who decided to help me. He took me to a Labs4rescue volunteer and saved my life. Labs4rescue's vet treated my heartworm, kennel cough, and badly infected foot. One of the bullets had knocked my hip out of alignment and I had two operations to correct this. I recuperated in a wonderful foster home, where I was received plenty of love, food and the medical care I deserved. You might think I would develop temperament problems due to my mistreatment. I am so happy to be safe, that I totally forgot about my past. I am so lucky to now be with my ";forever family." I know that I was very lucky and was given a second chance that not too many other Labs get, for that I am grateful. But there are still so many other labs out there who need our help. Please help Labs4rescue help other Labs like me.